The Central Iowa ACEs Steering Committee is a broad-based coalition of business, education, nonprofit and philanthropic entities that are leading efforts to raise awareness of the life-long impacts of childhood trauma and to support initiatives working to prevent or mitigate its effects. To improve the health and well-being of all by empowering communities, organizations and people to take informed actions to prevent and mitigate the lifelong effects of childhood adversity. All people will thrive in a compassionate community that supports lifelong healthy development. Expand educational opportunities, tools and resources available to learn about ACEs. Monitor current and emerging data and research related to ACEs and how to utilize it to create a compelling message for various constituencies. Collaborate and create consistent brand and messaging on ACEs. Support the preparation and implementation of the Connections Matter community campaign. Build sector-specific engagement strategies to empower action. Create sector-specific educational opportunities, tools and resources. Develop 1-2 community learning or networking events each year. Participate in partner-led coalitions connecting to the prevention and mitigation of ACEs. Educate and advance practice change within government departments and human service organizations and systems. Participate in relevant community coalitions addressing practice change. Provide leadership for ACEs advocacy coalition. Build connection to grassroots advocates throughout the state. The Central Iowa Aces 360 Steering Committee’s strategic plan follows the Spectrum of Prevention framework to ensure a multi-faceted, comprehensive approach for responding to ACEs. Provides a venue for professionals, community members, stakeholders, and any interested parties to network and be part of the ACEs movement in Central Iowa. 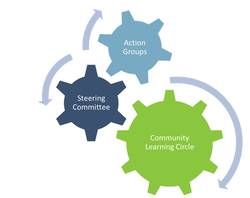 The learning circle will convene at least twice a year to share information and opportunities for engagement, and members will receive a bi-annual newsletter. Provides overall leadership for the Central Iowa ACEs 360 coalition. The steering committee will consist of stakeholders representing identified organizations or coalitions, whose role on the committee is to focus on the collective community efforts to prevent and mitigate the impact of ACEs. Responsible for moving work forward in alignment with the strategic areas set forth by the Steering Committee. Action groups will include the advocacy coalition, sector-based work groups, and ad-hoc committees. These groups will meet as needed to facilitate work. To become involved, please contact us.